Objective To summarise the benefits and harms of treatments for women with gestational diabetes mellitus. Data sources Embase, Medline, AMED, BIOSIS, CCMed, CDMS, CDSR, CENTRAL, CINAHL, DARE, HTA, NHS EED, Heclinet, SciSearch, several publishers’ databases, and reference lists of relevant secondary literature up to October 2009.
Review methods Included studies were randomised controlled trials of specific treatment for gestational diabetes compared with usual care or “intensified” compared with “less intensified” specific treatment. Results Five randomised controlled trials matched the inclusion criteria for specific versus usual treatment. All studies used a two step approach with a 50 g glucose challenge test or screening for risk factors, or both, and a subsequent 75 g or 100 g oral glucose tolerance test. Meta-analyses did not show significant differences for most single end points judged to be of direct clinical importance. In women specifically treated for gestational diabetes, shoulder dystocia was significantly less common (odds ratio 0.40, 95% confidence interval 0.21 to 0.75), and one randomised controlled trial reported a significant reduction of pre-eclampsia (2.5 v 5.5%, P=0.02). For the surrogate end point of large for gestational age infants, the odds ratio was 0.48 (0.38 to 0.62). 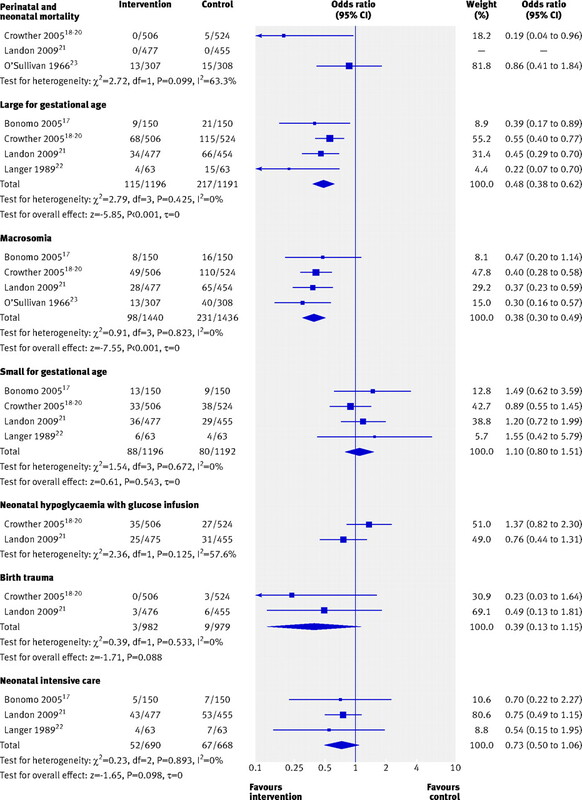 In the 13 randomised controlled trials of different intensities of specific treatments, meta-analysis showed a significant reduction of shoulder dystocia in women with more intensive treatment (0.31, 0.14 to 0.70). Conclusions Treatment for gestational diabetes, consisting of treatment to lower blood glucose concentration alone or with special obstetric care, seems to lower the risk for some perinatal complications. Decisions regarding treatment should take into account that the evidence of benefit is derived from trials for which women were selected with a two step strategy (glucose challenge test/screening for risk factors and oral glucose tolerance test). The main options for diagnosis are a one step oral glucose tolerance test (either taking measurements at fasting, one and/or two hours after 75 g glucose, or at fasting, one, two, and three hours after 100 g) or a two step strategy. This entails screening with either a list of risk factors or a one hour 50 g glucose challenge test and then an oral glucose tolerance test only in those women with positive results. Women’s preferences have not been systematically studied. We conducted a systematic review to determine what possible beneficial effects can be achieved by specific treatment of gestational diabetes and which women and their offspring will benefit from such treatment. We included treatments aimed at lowering blood glucose concentration with or without specific obstetric interventions, such as routine induction of labour. We gave special consideration to the selection strategies used to recruit women for the intervention trials. Our main aim was to assess the effects of specific interventions for gestational diabetes on the risk of pregnancy, perinatal, and long term complications in pregnant women with carbohydrate intolerance identified by a glucose tolerance test. Benefit from treatment in these women is a prerequisite for effectiveness of a screening programme for gestational diabetes. To be eligible for inclusion in our systematic review, studies had to examine specific treatment for gestational diabetes compared with usual care or “intensified” specific treatment with “less intensified” specific care, had to include pregnant women with an impairment of their glucose tolerance (based on the results of an oral glucose tolerance test), and had to report on at least one outcome of interest (see below). We included only randomised trials. As one would not expect to see an effect of an intervention in studies aimed at non-inferiority or equivalence for the head-to-head treatment comparisons, we excluded trials if there was no clear difference in intensity (for example, additional treatment, earlier treatment, earlier and more frequent treatment, lower target concentrations for blood glucose, special neonatal care, etc) of interventions planned. We carried out a literature search using Embase, Embase Alert, Medline, AMED, BIOSIS, BIOSIS Preview, CCMed, CDMS, CDSR, CENTRAL, CINAHL, DARE, HTA, NHS EED, Heclinet, Journals@Ovid Full Text, SciSearch, publishers’ databases (Hogrefe, Karger, Kluwer, Krause and Pachernegg, Springer, Thieme), and the reference lists of relevant secondary literature up to October 2009. Multiple teams of two reviewers (AS, KH, KJ, EM, and/or additional researchers) independently screened the title, abstract, and key words of each reference identified by the search and applied the inclusion and exclusion criteria. For potentially eligible references the same procedure was applied to full text articles. Differences between reviewers were resolved by discussion or a third reviewer (AS, KH, KJ, EM, UP, KK). Data on quality, patients’ characteristics, interventions, and relevant outcomes were independently abstracted by two reviewers (AS, KH, KJ, EM, UP, and/or KK). Assessment of risk of bias was based on the adequacy of randomisation, allocation concealment, blinding of outcome assessors, comparability of women in the different intervention groups for prognostically relevant factors at baseline, and handling of missing values (such as withdrawals and drop outs). As gestational diabetes is treated by complex interventions that are not amenable to blinding, we did not consider lack of blinding of patients and study staff to be a major flaw. Differences between reviewers were resolved by discussion or a third reviewer (RB). The interventions were compared for their effect on several outcomes relevant to patients: maternal and perinatal mortality, birth injuries, mode of delivery, shoulder dystocia, pre-eclampsia and eclampsia, neonatal hypoglycaemia, hyperbilirubinaemia and other metabolic disturbances needing an intervention, respiratory distress needing respiration, admission to neonatal intensive care, length of hospital stay, aspects of quality of life, and adverse events. Surrogate parameters considered included macrosomia or large for gestational age infants, small for gestational age infants, preterm birth, Apgar score, development of obesity in the child, gestational hypertension, and development of type 2 diabetes later in the woman’s life. When clinically and statistically appropriate, we combined results from single studies by meta-analysis using a random effects model based on the method of DerSimonian and Laird.11 The effects measure was the odds ratio. In the case of rare events (<1%) we used the Peto one step method to pool odds ratios.12 Heterogeneity between trials was assessed with χ2 test and the I2 statistic, which describes the percentage of the variability in effect estimates caused by heterogeneity.13 14 In the case of substantial heterogeneity (P<0.2)15 no pooled estimate was provided. Figure 1⇓ shows the number of trials identified and included with reasons for exclusion. The identified studies were allocated to one of two study pools based on the control treatment. Pool A contained all randomised trials of specific treatment for gestational diabetes mellitus compared with usual care. Pool B contained all randomised trials that compared specific treatments of different intensities. The comparison with usual care enabled direct inferences and effect sizes to be drawn. Pool B allowed for indirect conclusions, including the evaluation of dose-response relations. 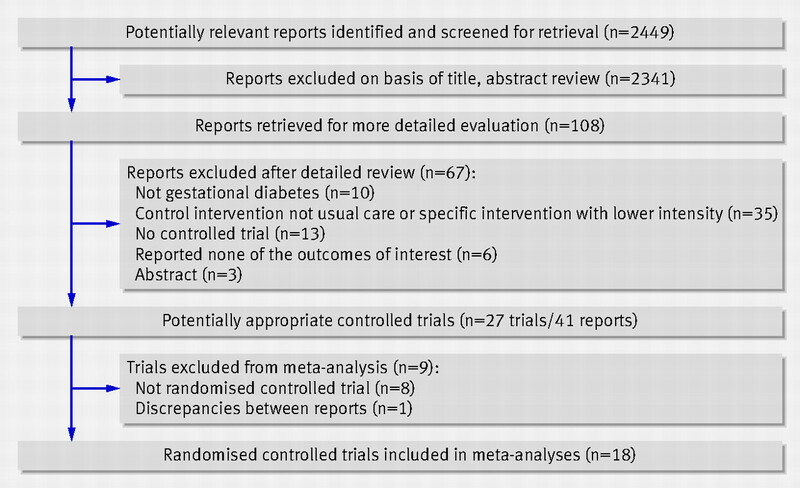 Five randomised trials matched the inclusion criteria for specific treatment for gestational diabetes compared with usual care (table 1)⇓.17 18 19 20 21 22 23 The trials were published from 1966 to 2009 and included 2999 women. Only one trial reported on long term complications in the mother. O’Sullivan et al reported that 35% of women in the specific treatment and 36% of women in the usual care group developed diabetes within 16 years after delivery (table 4⇑).23 The difference was not significant. Other long term outcomes were not reported. 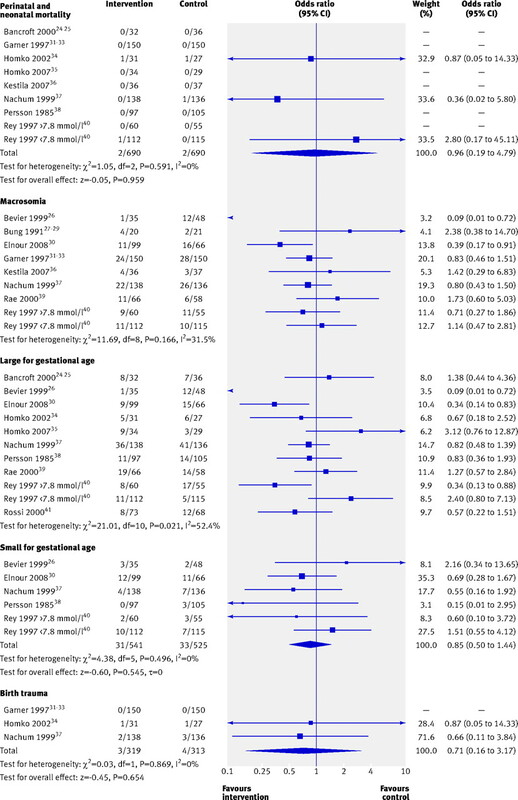 The number of large for gestational age infants was significantly lower in the treatment groups than in the usual care groups in four studies (table 5)⇑.17 19 21 22 Data from these studies were also included in a meta-analysis, which showed a significant reduction with specific treatment for gestational diabetes mellitus (0.48, 0.38 to 0.62; fig 3)⇑. Macrosomia was also significantly reduced in groups with specific treatment (0.38, 0.30 to 0.49). The number of small for gestational age infants did not differ significantly between groups (table 5⇑ and fig 3⇑). Crowther et al reported a combined end point, which consisted of any of perinatal death, shoulder dystocia, bone fracture, or nerve palsy.19 Such complications were seen in 1% of all babies from mothers in the intervention group and 4% of babies born to mothers in the usual care group (P=0.01 for difference). Landon et al also reported a composite neonatal outcome, including stillbirth, neonatal death, hypoglycaemia, hyperbilirubinaemia, raised C peptide concentration in cord blood, and birth trauma, as the designated primary end point.21 This outcome occurred in 32% of babies from mothers with specific treatment and 37% of babies from mothers in the usual care group (P=0.14 for difference). No adverse effects from treatment were reported. No trials reported on long term effects in the children. Tables 6 and 7 show results from individual studies⇓ ⇓. None of the trials reported any maternal deaths. More intensive treatment had no significant effects on the incidence of caesarean section (1.04, 0.80 to 1.34; fig 4)⇓. Five trials provided information on pre-eclampsia.26 30 34 35 39 Because of the high heterogeneity (P=0.116; I2=46.1%) we did not perform a combined analysis (fig 4⇓). The difference between the comparison groups reached significance in only one trial30 (table 6).⇓ The pooled estimate showed a significant reduction in shoulder dystocia in women with intensified treatment (0.31, 0.14 to 0.70; fig 4). Only one trial provided information on the development of diabetes mellitus later in life.24 25 While no women in the intensified treatment group developed diabetes, this was the case for two women (7%) in the control group. The difference was not significant. It remains unclear how long after giving birth the women were tested. As for adverse events with intensified treatment of gestational diabetes, only two studies reported on maternal hypoglycaemia. In the trial by Bung et al no woman experienced a hypoglycaemic episode.27 28 29 In the study by Nachum et al, one woman (0.7%) in each of the comparison groups experienced serious hypoglycaemia.37 We found no information on possible adverse effects of false positive or false negative test results and labelling and on behavioural changes postpartum. Eight studies reported on perinatal mortality,24 25 31 32 33 34 35 36 37 38 40 with four perinatal deaths in 1380 pregnant women. The pooled estimate did not show a significant difference between intensified and less intensified treatment (0.96, 0.19 to 4.79; fig 5)⇓. Three trials reported results on birth trauma (nerve palsy and bone fracture).31 32 33 34 37 A pooled analysis showed no significant difference between the effects of intensified and less intensified treatment (0.71, 0.16 to 3.17; fig 5). We found no information on neonatal hypoglycaemia necessitating glucose infusion or on the necessity of breathing support in babies with respiratory distress syndrome. Insufficient data on possible long term effects for the children were available. Adverse effects from treatment were not reported. Table 7⇑ gives results on gestational age at delivery. None of the studies that reported on this outcome found significant differences between the comparison groups. In this systematic review we found that shoulder dystocia is reduced significantly in women treated for gestational diabetes. Women who received specific treatment for gestational diabetes also had fewer macrosomic babies or babies with a birth weight at or above the 90th centile. Specific treatment had no significant effects on the number of babies small for gestational age or on perinatal or neonatal death,19 21 though perinatal death was much more common in one older study,23 probably reflecting the advances in pregnancy and neonatal care from the 1960s to today. We included data from randomised controlled trials that looked at specific treatment compared with usual care (study pool A) from five studies. Within this pool the studies by Crowther et al19 and Landon et al21 had the largest number of women included and had a low risk of bias. Results from randomised controlled trials that compared different intensities of treatment for gestational diabetes (study pool B) showed a significant reduction in risk for shoulder dystocia with more intense treatment. There were only four perinatal deaths in 1380 pregnancies. The reduction in macrosomia was not significant. Results from study pool B were comparable with those from pool A for the end points of small for gestational age and major maternal complications. Based on the results we concluded that specific treatment for gestational diabetes, mostly consisting of treatment to lower blood glucose concentration, alone or with special obstetric care, seems to lower the risk of some perinatal or neonatal complications. We did not find sufficient data to draw any conclusions on possible long term effects of treatment for gestational diabetes in the mothers or their children. To our knowledge this review is the most current report on the topic and includes the recently published trial by Landon et al.21 It also benefits from a thorough search and assessment of randomised controlled trials, performance of meta-analyses on a wide range of maternal and neonatal outcomes, and the differentiation between trials investigating specific treatment for gestational diabetes and usual care and trials studying different intensities of treatment. The evidence on beneficial effects of treatment, however, is still unstable. Although we identified many studies investigating the effects of treatment, effects on major end points important to patients remain uncertain. These complications are infrequent and information is available from only a few of the included studies. Two studies19 21 dominated the results, so the limitations of these trials must be considered. In Crowther et al19 women in the control group had gestational diabetes but they and their perinatal care providers were told that they did not have it. Women in the intervention group were not blinded. This can be seen as a possible bias leading to undertreatment in the control group or overtreatment in the intervention group (or both). In usual care “telling” is part of the intervention, so this is likely to reflect what happens when labelling a pregnant woman with the diagnosis of gestational diabetes. Induction of labour and transfer of newborns to a neonatal nursery were higher in the intervention group. We regarded these interventions as part of the specific care for gestational diabetes. It is unclear whether these interventions were responsible for the improved neonatal outcomes or whether they were overtreatment (and a harm) induced by labelling. A second limitation in that study is the choice of a combined end point.19 Though this end point has been criticised44 because it depends heavily on shoulder dystocia, a subjective end point, we accepted it as valid. A sensitivity analysis showed that even without inclusion of shoulder dystocia, the rates would be significantly different (data not shown). We did not consider the combined end point in the study by Landon et al21 as valid because it included surrogate end points like concentrations of C peptide in cord blood. Although we considered the risk of bias in their study in general to be low, for some end points we thought the risk of bias was higher because not all randomised women were included in the analyses. Study pool B contained trials that tested a broad spectrum of different interventions, including different forms of blood glucose monitoring and treatments with oral antidiabetic drugs. Also, the selection criteria were heterogeneous between studies. This heterogeneity, and the fact that most of the trials from pool B were at high risk of bias, makes it more difficult to draw sound inferences. It is reassuring, however, that the results from both study pools were concordant. Another limitation concerns the transferability of the results. As most of the included studies were conducted in North America, Europe, and Australia not all ethnic groups were sufficiently represented. It remains unclear if the results found are applicable to women from, for example, South East Asia and China. Our conclusions are also somewhat restricted as the included trials did not explicitly investigate the harms of treatment. Crowther et al reported that women in the intervention group did not worry more or less than women in the control group but did significantly better in regard to depression after birth, physical functioning, and health state utility.19 But these analyses have a high risk of bias because a high percentage of women were not included in the analyses. Rates of caesarean section, proportion of small for gestational age babies, and gestational age at birth were not significantly different between interventions so no indication of labelling or other harmful effects was found for these outcomes. Even though international bodies and experts recognise that women with gestational diabetes have an increased risk of developing diabetes later in life, only two out of the 18 studies included in our systematic review reported on this outcome. We also found no information on possible behavioural changes in women to prevent diabetes and insufficient data on long term outcomes in the children. The strongest evidence for beneficial effects of treatment comes from studies in which insulin was the sole pharmacological agent used for lowering blood glucose. 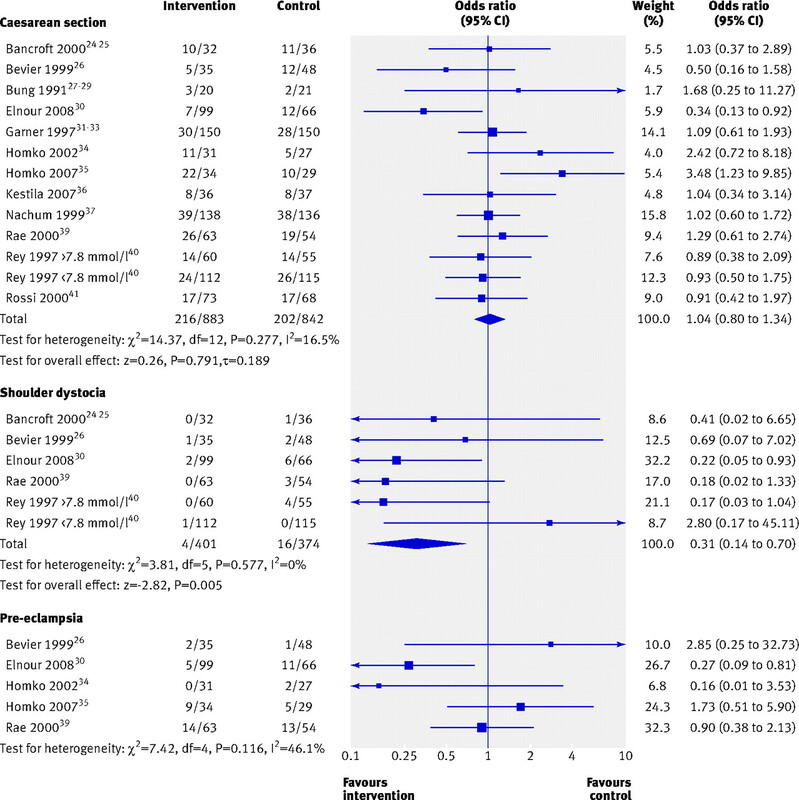 Our systematic review did not compare insulin with oral antidiabetic agents. A recent systematic review from the Agency for Healthcare Research and Quality found that maternal glucose concentrations do not differ substantially in those treated with insulin compared with insulin analogues or oral agents.45 The authors also state that their conclusions were weakened by the low number of available studies and the paucity of outcomes reported. In 2008 the US Preventive Services Task Force (USPSTF) published a report on screening for gestational diabetes.4 In that review Hillier et al included eight randomised controlled trials investigating the effects of specific treatment for gestational diabetes. Of these, four studies19 23 24 37 were also included in our systematic review. We excluded the other four studies because they did not fulfil our inclusion criterion concerning a difference in the intensity of treatment.46 47 48 49 The task force did not accept shoulder dystocia as a valid end point and concluded that current evidence was insufficient to assess the balance of benefits and harms of screening for gestational diabetes. No meta-analyses were performed in this report. In 2008 the National Institute for Health and Clinical Excellence (NICE) issued new guidelines for the management of pregnant women with diabetes mellitus50 and for the care of healthy pregnant women.8 These guidelines recommend a two step screening strategy for gestational diabetes in all healthy pregnant women on the basis of risk factors and a 75 g oral glucose tolerance test. For diagnosis the WHO cut-off values9 are recommended. Does the evidence support screening for gestational diabetes? We consider there is a benefit with intensive treatment, including daily self measurement, diet, and, for some women, insulin and additional obstetric intervention. Compared with routine care this management is associated with a reduction in the incidence of shoulder dystocia and macrosomia. Currently there is less robust evidence that treatment for gestational diabetes leads to a reduction in more serious maternal or perinatal complications. This benefit, although limited, might be seen as a justification for screening. It is not known if screening has harms serious enough to counterbalance the possible benefits of treatment. Effects can be fully judged only by screening trials, which follow up women with negative screening results. As there are no reliable screening studies available4 8 50 and we could not identify ongoing studies, we do not expect the evidence base to change much in the foreseeable future. In our opinion proposals for screening for gestational diabetes have to take into account that some evidence of benefit of treatment is derived from trials for which women were selected by a two step strategy combining a glucose challenge test (or screening for risk factors, or both) and an oral glucose tolerance test. We think that the transferability of benefits cannot be taken for granted. For example, while women in all the interventional studies in pool A were selected in a two step process consisting of a 50 g glucose challenge test (or screening for risk factors, or both) and a second 75 g or 100 g oral glucose tolerance test, women in HAPO2 underwent only a one step 75 g oral glucose tolerance test. Transferability is also hampered by the fact that the studies applied different inclusion and exclusion criteria, recruited different ethnic groups, and defined outcomes differently. An indication that this might have an impact is that, although the mean fasting blood glucose concentrations in the studies of Crowther et al19 and Landon et al21 were similar (86.5 mg/dl (4.76 mmol/l) and 86.6 mg/dl (4.77 mmol/l), respectively) and not that different from that in HAPO2 (80.9 mg/dl (4.46 mmol/l)), the incidence of large for gestational age babies in the control groups was rather different (22%,19 15%,21 9.5%2). Studies comparing different screening strategies for gestational diabetes are needed to allow for a proper assessment of the balance of benefit and harms of screening. Pregnant women should be informed about the possible benefits as well as the uncertainties concerning screening. Recommendations for screening strategies should mirror the selection strategies of women for whom a benefit of treatment has been shown. We thank P T Sawicki for repeated reviewing of the data and manuscript; S Droste and S Waffenschmidt for assistance with the literature search strategies; A Steinzen, M Messer, and Y Zens for help with literature screening; and E Vervölgyi, C Schürmann, and S Sturtz for help with additional analyses. Contributors: All authors contributed to the writing of the study protocol, and the interpretation of data. They also contributed in drafting the article or in revising it critically for important intellectual content and approved the final version. KH, KK, and AS are guarantors. M Häusler contributed as a specialist in obstetrics and gynaecology in preparing the original IQWiG report. U Pueringer helped in collecting data. Funding: This study was commissioned by the German Federal Joint Committee. KH, KJ, EM, and AS acted as consultants for the preparation of the review. For this they were reimbursed by IQWiG. KK, RB, HB, and SL (as well as PTS, SD, SW, AS, MM, YZ, EV, CS, and SS) are employees of IQWiG. Competing interests: All authors have completed the Unified Competing Interest form at www.icmje.org/coi_disclosure.pdf (available on request from the corresponding author) and declare that all authors (KH, KK, KJ, EM, RB, HB, SL, AS) have no support from any company for the submitted work, have no relationship with companies that might have an interest in the submitted work in the previous 3 years; their spouses, partners or children have no financial relationship that may be relevant to the submitted work; and have no non-financial interests that may be relevant to the submitted work. Data sharing: The search strategy and detailed information on further maternal and neonatal outcomes for studies from both pools can be found at www.iqwig.de/download/S07-01_Abschlussbericht_Screening_auf_Gestationsdiabetes.pdf. Metzger BE, Coustan DR. Summary and recommendations of the Fourth International Workshop-Conference on Gestational Diabetes Mellitus. Diabetes Care1998;21(suppl 2):161-7S. Metzger BE, Lowe LP, Dyer AR, Trimble ER, Chaovarindr U, Coustan DR, et al. Hyperglycemia and adverse pregnancy outcomes. N Engl J Med2008;358:1991-2002. Bellamy L, Casas JP, Hingorani AD, Williams D. Type 2 diabetes mellitus after gestational diabetes: a systematic review and meta-analysis. Lancet2009;373:1773-9. Hillier TA, Vesco KK, Pedula KL, Beil TL, Whitlock EP, Pettitt DJ. Screening for gestational diabetes mellitus: a systematic review for the US Preventive Services Task Force. Ann Intern Med2008;148:766-75. Ferrara A. Increasing prevalence of gestational diabetes mellitus: a public health perspective. Diabetes Care2007;30(suppl 2):141-6S. Deutsche Gesellschaft für Gynäkologie und Geburtshilfe. Diagnostik und Therapie des Gestationsdiabetes (GDM). 2001. www.agmfm.de/_download/unprotected/g_04_03_04_diagnostik_therapie_gdm.pdf. American Diabetes Association. Standards of medical care in diabetes: 2007. Diabetes Care2007;30(suppl 1):4-41S. National Collaborating Centre for Women’s and Children’s Health. Antenatal care: routine care for the healthy pregnant woman. RCOG Press, 2008. World Health Organization. Definition, diagnosis and classification of diabetes mellitus and its complications. Report of a WHO consultation. Part 1: diagnosis and classification of diabetes mellitus. 1999. www.diabetes.com.au/pdf/who_report.pdf. Canadian Diabetes Association. 2003 clinical practice guidelines for the prevention and management of diabetes in Canada. Can J Diabetes2003;27(suppl 2):1-152S. Bradburn MJ, Deeks JJ, Berlin JA, Russell Localio A. Much ado about nothing: a comparison of the performance of meta-analytical methods with rare events. Stat Med2007;26:53-77. Jackson D. The power of the standard test for the presence of heterogeneity in meta-analysis. Stat Med2006;25:2688-99. Institut für Qualität und Wirtschaftlichkeit im Gesundheitswesen. Screening auf Gestationsdiabetes. Berichtsplan S07-01. Version 1.0. IQWIG, 2007. Bonomo M, Corica D, Mion E, Goncalves D, Motta G, Merati R, et al. Evaluating the therapeutic approach in pregnancies complicated by borderline glucose intolerance: a randomized clinical trial. Diabet Med2005;22:1536-41. Athukorala C, Crowther CA, Willson K. Women with gestational diabetes mellitus in the ACHOIS trial: risk factors for shoulder dystocia. Aust N Z J Obstet Gynaecol2007;47:37-41. Crowther CA, Hiller JE, Moss JR, McPhee AJ, Jeffries WS, Robinson JS. Effect of treatment of gestational diabetes mellitus on pregnancy outcomes. N Engl J Med2005;352:2477-86. Moss JR, Crowther CA, Hiller JE, Willson KJ, Robinson JS. Costs and consequences of treatment for mild gestational diabetes mellitus: evaluation from the ACHOIS randomised trial. BMC Pregnancy Childbirth2007;7:27. Landon MB, Spong CY, Thom E, Carpenter MW, Ramin SM, Casey B, et al. A multicenter, randomized trial of treatment for mild gestational diabetes. N Engl J Med2009;361:1339-48. Langer O, Levy J, Brustman L, Anyaegbunam A, Merkatz R, Divon M. Glycemic control in gestational diabetes mellitus: how tight is tight enough; small for gestational age versus large for gestational age? Am J Obstet Gynecol1989;161:646-53. O’Sullivan JB, Gellis SS, Dandrow RV, Tenney BO. The potential diabetic and her treatment in pregnancy. Obstet Gynecol1966;27:683-9. Bancroft K, Tuffnell DJ, Mason GC, Rogerson LJ, Mansfield M. A randomised controlled pilot study of the management of gestational impaired glucose tolerance. BJOG2000;107:959-63. Lao T, Ho LF. A randomised controlled pilot study of the management of gestational impaired glucose tolerance. BJOG2001;108:769. Bevier WC, Fischer R, Jovanovic L. Treatment of women with an abnormal glucose challenge test (but a normal oral glucose tolerance test) decreases the prevalence of macrosomia. Am J Perinatol1999;16:269-75. Bung P, Artal R, Khodiguian N. Regelmässige Bewegungstherapie bei Kohlehydratstoffwechselstörungen in der Schwangerschaft: Ergebnisse einer prospektiven, randomisierten Longitudinalstudie. Geburtshilfe Frauenheilkd1993;53:188-93. Bung P, Artal R, Khodiguian N, Kjos S. Exercise in gestational diabetes: an optional therapeutic approach? Diabetes1991;40(suppl 2):182-5S. Bung P, Bung C, Artal R, Khodiguian N, Fallenstein F, Spatling L. Therapeutic exercise for insulin-requiring gestational diabetics: effects on the fetus—results of a randomized prospective longitudinal study. J Perinat Med1993;21:125-37. Elnour AA, El Mugammar I, Jaber T, Revel T, McElnay JC. Pharmaceutical care of patients with gestational diabetes mellitus. J Eval Clin Pract2008;14:131-40. Garner P, Okun N, Keely E, Wells G, Perkins S, Sylvain J, et al. A randomized controlled trial of strict glycemic control and tertiary level obstetric care versus routine obstetric care in the management of gestational diabetes: a pilot study. Am J Obstet Gynecol1997;177:190-5. Keely EJ, Malcolm JC, Hadjiyannakis S, Gaboury I, Lough G, Lawson ML. Prevalence of metabolic markers of insulin resistance in offspring of gestational diabetes pregnancies. Pediatr Diabetes2008;9:53-9. Malcolm JC, Lawson ML, Gaboury I, Lough G, Keely E. Glucose tolerance of offspring of mother with gestational diabetes mellitus in a low-risk population. Diabet Med2006;23:565-70. Homko CJ, Sivan E, Reece EA. The impact of self-monitoring of blood glucose on self-efficacy and pregnancy outcomes in women with diet-controlled gestational diabetes. Diabetes Educ2002;28:435-43. Homko CJ, Santamore WP, Whiteman V, Bower M, Berger P, Geifman-Holtzman O, et al. Use of an internet-based telemedicine system to manage underserved women with gestational diabetes mellitus. Diabetes Technol Ther2007;9:297-306. Kestila KK, Ekblad UU, Ronnemaa T. Continuous glucose monitoring versus self-monitoring of blood glucose in the treatment of gestational diabetes mellitus. Diabetes Res Clin Pract2007;77:174-9. Nachum Z, Ben-Shlomo I, Weiner E, Shalev E. Twice daily versus four times daily insulin dose regimens for diabetes in pregnancy: randomised controlled trial. BMJ1999;319:1223-7. Persson B, Stangenberg M, Hansson U, Nordlander E. Gestational diabetes mellitus (GDM): comparative evaluation of two treatment regimens, diet versus insulin and diet. Diabetes1985;34(suppl 2):101-5S. Rae A, Bond D, Evans S, North F, Roberman B, Walters B. A randomised controlled trial of dietary energy restriction in the management of obese women with gestational diabetes. Aust N Z J Obstet Gyanecol2000;40:416-22. Rey E. Usefulness of a breakfast test in the management of women with gestational diabetes. Obstet Gynecol1997;89:981-8. Rossi G, Somigliana E, Moschetta M, Bottani B, Barbieri M, Vignali M. Adequate timing of fetal ultrasound to guide metabolic therapy in mild gestational diabetes mellitus: results from a randomized study. Acta Obstet Gynecol Scand2000;79:649-54. Yang X, Hsu-Hage BH, Dong L, Shao P, Wang H, Tian H, et al. Intensive diabetes management may improve pregnancy: outcomes in Chinese gravidas with impaired glucose tolerance. Diabetes Care2003;26:254-5. Yang X, Hsu-Hage BH, Dong L, Zhang H, Zhang C, Zhang Y. Postpartum glucose intolerance in Chinese women with gestational diabetes. Diabet Med2003;20:687-9. Montori VM, Busse JW, Permanyer-Miralda G, Ferreira I, Guyatt GH. How should clinicians interpret results reflecting the effect of an intervention on composite endpoints: should I dump this lump? ACP J Club2005;143:A8-A9. Nicholson WK, Wilson LM, Witkop CT, Baptiste-Roberts K, Bennett WL, Bolen S, et al. Therapeutic management, delivery, and postpartum risk assessment and screening in gestational diabetes. Evid Rep Technol Assess (Full Rep)2008;162:1-96. De Veciana M, Major CA, Morgan MA, Asrat T, Toohey JS, Lien JM, et al. Postprandial versus preprandial blood glucose monitoring in women with gestational diabetes mellitus requiring insulin therapy. N Engl J Med1995;333:1237-41. Jovanovic L, Ilic S, Pettitt DJ, Hugo K, Gutierrez M, Bowsher RR, et al. Metabolic and immunologic effects of insulin lispro in gestational diabetes. Diabetes Care1999;22:1422-7. Langer O, Conway DL, Berkus MD, Xenakis EM, Gonzales O. A comparison of glyburide and insulin in women with gestational diabetes mellitus. N Engl J Med2000;343:1134-8. Langer O, Yogev Y, Most O, Xenakis EM. Gestational diabetes: the consequences of not treating. Am J Obstet Gynecol2005;192:989-97. Guideline Development Group. Management of diabetes from preconception to the postnatal period: summary of NICE guidance. BMJ2008;336:714-7. Yogev Y, Metzger BE, Hod M. Establishing diagnosis of gestational diabetes mellitus: impact of the hyperglycemia and adverse pregnancy outcome study. Semin Fetal Neonatal Med2009;14:94-10.